The definition of luxury flooring.. Solid wood flooring is a warm, attractive and sturdy form of floor that offers householders a durable, reliable and impressive base to their interiors. The authentic, natural characteristics of real wood flooring also make solid wood floors a beautiful addition to any home. The striking appearance is matched by a long-life expectation that, with the right maintenance, will see the floor provide many years of excellent quality service. The wood comes in thick planks and as it can expand or contract with moisture it must be installed in the correct way to allow it space for small adjustments in size. But as long as this is the case it provides a beautiful centrepiece to a home from a completely organic source, with qualities that artificial flooring may struggle to get near. 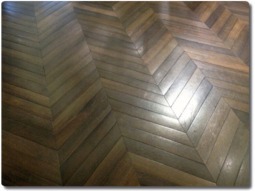 Hardwood surfaces are not only known for being an attractive and incredibly distinctive style of flooring. They also have the original, natural element which even the best artificial flooring materials would find difficult to match.